If you are a veteran Humanities PhD student, you probably know that the SALC Graduate School and the Careers Service have joined forces to make it even easier for all Humanities PGRs to access career support. If you are new, now you know! 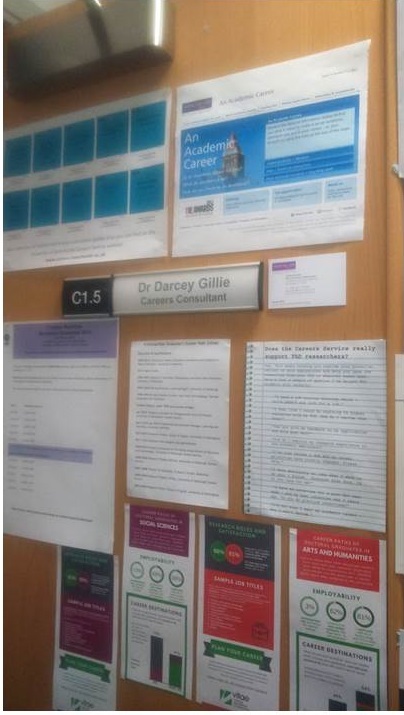 I hold drop-in guidance appointments in my office in Ellen Wilkinson C1.5 (some of you might have already noticed the door and/or me bedecking it and the walls with useful careers stuff). If the door is open, do stop in and say hello (if the door is closed, I will be having an appointment with someone. Or not there.). If you aren’t normally in the Ellen Wilkinson Building, please note I am in C1.5, not 1.5o – which does exist, but in another part of the building and for a wholly different purpose! What is careers guidance (and why might it be useful)? That phrase is made up of two words with interesting histories. Our modern ‘career’ derives from the French carrière –’ a racecourse for horses’, later meaning ‘a path, a course that one follows’ before finally acquiring its modern sense of ‘a person’s course or progress through life’. We are often a strange country to ourselves. When I ran a workshop with a group of second year PhD students, in response to my questions none – apparently – had any achievements, skills, knowledge or experience. As University of Manchester PhD students from all over the world, I know and you know, that’s simply not true. There are two things going on there – often we don’t know our own achievements very well because we haven’t stopped to reflect on them, and, sadly, we are too often conditioned to minimise our achievements rather than be able to speak about them confidently. We don’t benefit from the experiences of others, and they don’t benefit from yours. Everyone loses. In a guidance appointment I won’t tell you what to do (or not to do), but I will conduct you on a tour of yourself and point out objects of interest and curiosity in your life. My aim is to help you assert as much control over your career as possible – a ‘progress through life abounding with remarkable incidents’ (OED sense 5a. – doesn’t that sound quite appealing?) rather being feeling like you’re being dragged on a wild gallop by an errant horse. As ever, I look forward to meeting and working with you during the coming year!